We have a waiting list for these highly sought after puppies. Please get in touch for info. 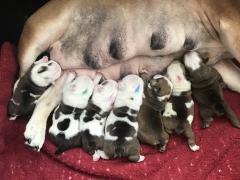 Here they are at mums milk bar! They have been colour coded so we can monitor their growth, weight & general progress.